Given two sets of attributes, X = (x1, x2, ..., xp) and Y = (y1, y2, ..., yq), how do we quantify the dependency between X and Y? If both X and Y are one dimensional numerical attributes, we can use linear correlation coefficient to quantify the dependency between X and Y. For multidimensional X and Y (that is our data are numerical matrices of dimension n×p and n×q respectively, assuming that we have sampled n data points) we can use canonical correlation analysis (CCA) to capture the dependency between X and Y. Linear methods are in general effective and simple to use. VisuMap offers support for CCA and many other linear analysis services through a plugin module MultivariateAnalysis. However, linear methods work only for numerical attributes and can only capture linear relationships. In general, R(X; Y) tells us how much information we gain about Y when the value of X becomes known. R(X; Y) is a number between 0 and 1.0. If R(X;Y)=0, then X and Y are independent from each other, knowing X does not provide any information about Y. If R(X;Y)=1.0, then Y is completely dependent on X, i.e. Y is completely determined by the value of X. We notice that GIGR in above formula is indexed by the two clustering algorithms C and D. This means that the calculation is dependent on what clustering algorithms we choose for X and Y. In other words, the method described here is actually a meta-algorithm that requires, apart from two input data tables, also two clustering algorithms as input. The clustering algorithms C and D plays an essential role in GIGR. They determine the granularity of the entropy calculation. More particularly, RC,D will be maximum if C and D are the finest clustering algorithms by creating unique label for each distinguished data point. On the other side, RC,D will be zero, if C and D, as the coarsest clustering algorithm, simply assign all data points to single label. We can also consider the clustering algorithm in GIGR as a quantization method that converts data from multidimensional discrete or continues domain to one-dimensional discrete domain, so that we can effectively apply the information theoretical calculation on them. In practise, C and D can be different clustering algorithms. The main requirement on C and D is that they can be applied on data tables X and Y separately and can assign a label to each data row. In fact, the data X and Y don't even have to be tables. They can be, for instance, a tree structures or DNA sequences. To apply our method, we just need to pick appropriate clustering algorithms for the data types. It should be pointed out here that GIGR described here does not bias towards any type of clustering algorithms. In fact, I believe that any clustering algorithm would be appropriate for certain type of problems. The attached script code implemented 6 different groups of clustering algorithms to calculate GIGR with VisuMap. Since the two clustering algorithms in GIGR are kind of input, we can use GIGR to investigate similarity between different clustering algorithms. For instance, if RC,D(X; X) is close 1.0 for a data set X, then the two clustering algorithms C and D produce similar results with respect to our data. Thus, in the practise, we might use the algorithm that is easier to implement, if the GIGR indicates that two algorithm produce similar results. Also along the same line, GIGR can be used as an indicator for the stability of clustering algorithms. Many clustering algorithms, like the k-mean algorithm, are non-deterministic in the sense that repeating the algorithm on the same data normally yields different result. We would normally favor an algorithm that maintain certain level of stability so that the clustering results remain more or less the same. When we calculate RC,C(X; X) by repeating algorithm C twice on X, we would normally get a GIGR value that is smaller than 1.0 for non-deterministic clustering algorithms. In these cases, there closer RC,C(X; X) is to the value 1.0, the more stable is C with respect to the data set X.
K-Mean algorithm (KMA) is a widely used clustering algorithm for multidimensional data. In this note, I'll show some intuitive behaviors of KMA with a very simple quantization task: Grouping a series of numeric values into multiple groups. An intuitive requirement for this task is: if some values are concentrated at a location, those values should be grouped together. 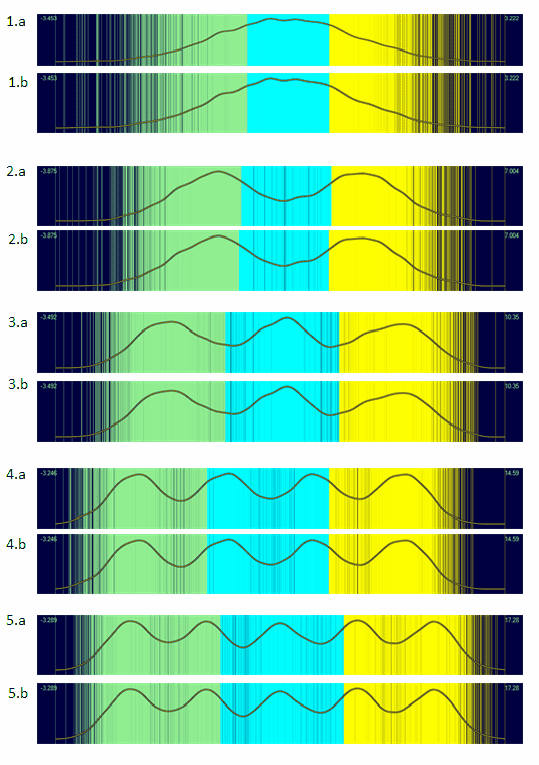 In above picture, each spectrum shows the result of one run of KMA on a dataset. 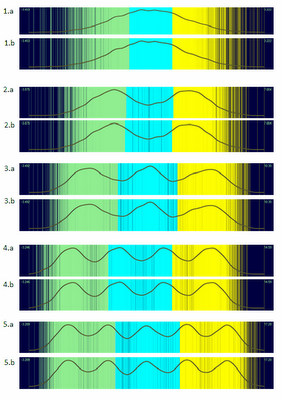 Each bar in the spectrum indicates a data point in a dataset. The curve on the spectrum shows the density of the data points. The bar colors indicate the clusters created by the KMA. We notice that all bars are colored by 3 different colors as the number of clusters, K, used KMA is 3. (1) N < K : In this case the KMA has to group fewer natural clusters into larger number of clusters. As be shown in spectrum 1.a, 1.b, 2.a and 2.b, KMA assigned more than one clusters (colors) to a natural cluster, but didn't assign one to multiple natural clusters. For instance, in spectrum 2.a, the first natural cluster has been split evenly into two clusters. (2) N = K : In this case the KMA has to group exact N natural clusters in to N clusters. We see in spectrum 3.a and 3.b that KMA did a nice job in this case. KMA acutally found the natural clusters. (3) N > K : KMA has to group more natural clusters into fewer clusters. As be shown in spectrum 4.a, 4.b, 5.a and 5.b, KMA, in this case, grouped multiple natural clusters together. KMA has not, at least not significantly, split natural clusters. How KMA groups the natural clusters can change from run to run, depending on the initialization of the algorithm. 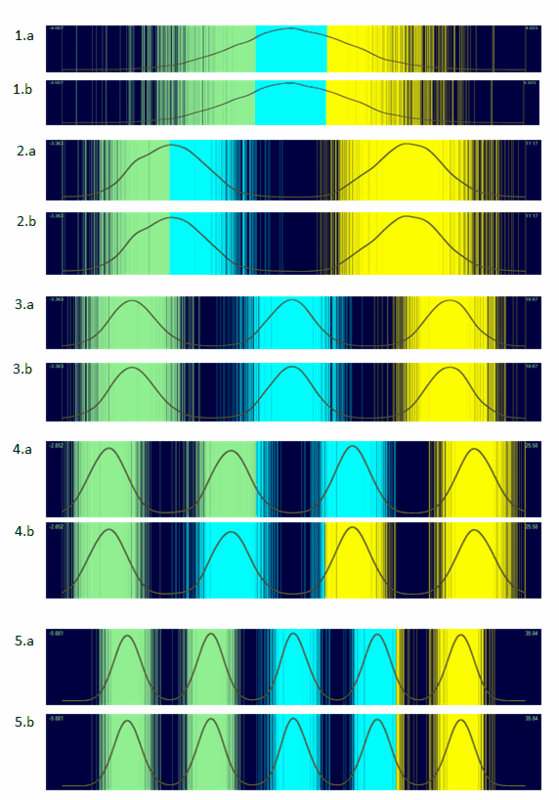 For instance, spectrum 4.a and 4.b show two different grouping created by two different KMA runs. In above picture, the 5 datasets are created similarly as before except that these natural clusters overlap each other somewhat. We see that, only for the case K=N, KMA found the exact natural clusters. For other causes, KMA does not respect the natural clusters. Actually, we can visually do a better job based on the density curves.